It’s November in Morocco – time for the annual fixture of the cultural calendar – the Essaouira Music festival. 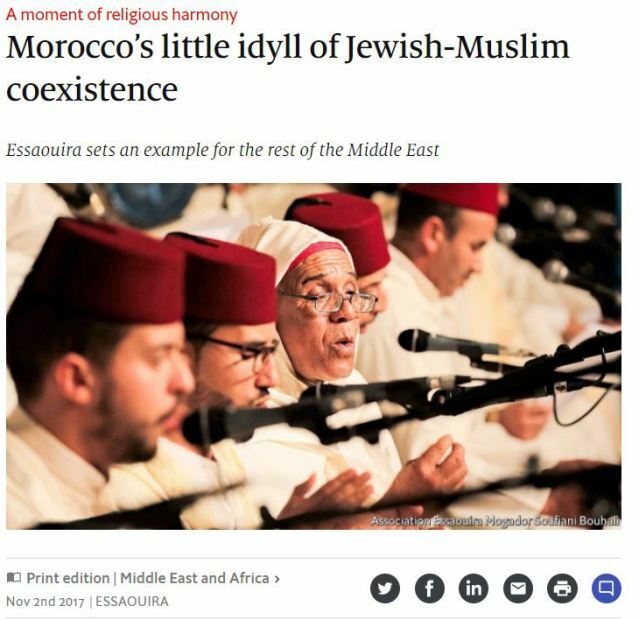 The Economist has been gushing about what it calls ‘Morocco’s little idyll of Jewish-Muslim coexistence’. Yet, the Nov. 2nd article admits that only three Jews still live in Essaouira – a city which used to have as many Jews as Muslims before the great exodus to Israel. One of those Jews is Jacquy Sebag, who was attacked with an axe by Muslim extremists in 2002 during the Palestinian intifada. You would never guess that unpleasant things ever happened to Jews in Morocco, which the Economist portrays as a haven from European persecution.